As time went by I amassed quite a few " rejected " castings probably due to the fact that both Rhuddlan and Buckley foundries " final assessment " areas were pretty dimly lit!! Before I sent a kit on its way all castings were thoroughly checked for the usual imperfections that the model engineer would also be looking for. With the recent upheaval and dispersement of Vincent's workshop I managed to find a near complete set of castings for the half scale Robinson " X " type or " Chippie " engine. Over the next few months, as time permits I will present a build log of a Robinson from rejects. The flywheel has always been my favourite item to machine first..... More to come. I like that one too and had been looking at how the cylinder could be fabricated or more likely machined from a lump of iron, main bed casting is not too bad to do as it is quite boxy. Look forward to following along with your build. Out of interest what sort of numbers were sold? I have nearly 15 rejected cylinder castings due to metal " shrink " within the inlet/exhaust tract area. This was eliminated by using an internal " Nob " , foundry parlance for an internal mass of Iron close to, on the runner where the shrink would occur. Because this mass was deep in the sand it kept its heat, feeding the casting as it cooled. I basically kept a whole batch of possibly suspect castings rather than send them out. The rather pretty number plates were photo etched by a firm down South, I bought 200 of them and the box is almost empty, 180 or so?? That is a really interesting engine. I do however confess I had to google to find out what exactly they were.! Many thanks for the video link, I was working from my ancient tablet earlier. The video shows a later patent engine with the conventional 2:1 in line gear reduction running on hot tube ignition. My replica was based upon the 1894 patent epicyclic gearbox version. Here's a link to number 103, the first model built by me. My website is still open at.... http://www.alynfoundry.co.uk/ Lots of nice photos to look at. Oh these engines are from the same manufacturer as the hot air engines. Mr Horace Robinson was a very clever man IMHO. In case anyone was wondering where the " Chippie " term originates? English slang for a Fish and Chip shop. Picture shows engine and potato chipper. The Robinson was my first attempt at " true " scale modelling, an iconic design in my opinion. Known as the " oblique " range they were made in various sizes up to, according to literature 10 HP !! The base doubling as a water tank. I haven't seen a larger one than the type " Z " circa 3 HP.
" ratchet " wheel to get around Otto's four cycle patent stranglehold. My version dates from 1894 or thereabouts. All foundries have their " ways " of doing things, Rhuddlan used to like pouring directly into the hub and have a large funnel shaped " sprue " to feed the casting with the hottest metal. Buckley on the other hand preferred the " Nob " on runner system, feeding the metal towards the hub via a couple of the spokes. The casting I chose to machine was a Rhuddlan one with a whacking great shrink into the hub, definitely one not to be sent to a customer! My workshop companion of over 30 years is a Le Blonde RP of wartime era. She's big and powerful but with a feel so good that even small precise parts can be made on the same machine. No leadscrew no topslide just power feed to " X " and " Y " with reverse facility and a monster four way toolpost. I got so used to her that I could put a single thou on with a rock of the handwheel. For flywheels my preferred method is to use my 8" diameter " monoblock " 3 jaw chuck and grip the inner rim by expanding the jaws. You can now see visually any " runout " and correct it by packing. The inner rim is un machinable, best to get that running true isn't it? I first tackle the hub and face off the front followed by a centre spot to carry a rotating centre, belt and braces!! With this method all faces of the wheel will end up being concentric to the bore, not a wobble, ever! Once faced I move onto the bore, in this case 1/2" diameter. As previously mentioned this wheel had quite a shrink cavity so I opted to use an over centre cutter rather than a drill bit to reduce any " whip " or wobble. It turned out to be only shallow so I re spotted and finished with a twist drill. I hate to see wobbly flywheels the usual cause is a poorly machined hole. I always drill undersize and use a tiny boring bar to get to the required size. Tedious, yes but well worth the extra effort. Drill bits can start to wobble and a reamer just follows. By boring all wobble is eliminated and the use of a floating reamer to take out the last few thou makes for a perfect ending. The final stage is to remove the wheel from the chuck fit your reverse jaws and machine the back face and hub. The chuck jaws providing the datum. A well earned " cuppa " completes this exercise. Pictures to follow. I like the unique design of the Robinson. Thanks for enlightenment on the "Chippie" name, I did not know that was how the engine got its name. I assume Robinson's also made the chipper and stand as it all looks to be made to suit. That would be a busy chip shop to need a 10HP engine! I also prefer to use a boring bar on flywheels, infact any hole that matters. With a casting there is even more risk of the drill wandering due to a bubble or hard spot and as you say a reamer will just follow the drills path. It seems AE&H Robinson manufactured a range of catering equipment the engines providing the power. I had a copy of a booklet listing the sizes of engines they made, the 10 HP engine stood at a height of 4 feet!! Regarding the flywheel, are pictures necessary? I mean it's the same old,same old. You could do them on a faceplate too, the trick is to get some packing behind to allow the cutting tool to finish right off the top face. The keyway on the half scale engine is 1/8" with a 1:100 taper Gib head key securing wheel to shaft. I have a few left over keys from my building days. I had to make my own. Dead easy under a fly press or arbour press. I used my medium fly press to finish the job. The flywheel now just needs cosmetic attention before painting. Perhaps the most interesting part of the engine is H Robinson's 1894 Epicyclic reduction gearbox. I made inquiries to various gear manufacturers about this rather special internal gear with its eccentric outside diameter to be met with almost telephone number prices! Something had to be done as I couldn't see prospective customers paying a " Kings ransom " for such a small part. Remembering that some UK agricultural engine makers had used " cast " gears rather than machine cut ones led me to thinking along the lines of gravity " Die castings " using a Zinc alloy. I chose a large tooth form to help with the non standard mesh that would occur by using an external gear as a die to form the internal casting. The final result actually beat all of my expectations, I was very pleased indeed. The attached photo shows the 3 piece die, a casting and a gearbox I made a few years ago. Alongside is a gear I cast and machined yesterday. I shall go into more detail on the making of this small but vital part next. You had better get your finger out if you are going to use up all those keys Do you cut your keyway in the flywheel to a matching taper? I have made a few bushes with the taper and as you say longer ones are often needed to support the broach through a long hub. I did buy a set of far eastern broaches - 1/16, 3/32 and 1/8 with bushes for a reasonable amount which are OK for the smaller models but 5/32 and 3/16 are also needed. I had thought of doing the internal gear in much the same way as I did keyways before I had the broaches by using a profile tool in a bar held in the toolpost and plane out the teeth with the carrage, I did have a quick try and it looks like it should work. I suppose now an option would be to laser or water jet cut the part, either offset in a disc that could be soldered into the arm or with the whole are that could then be further machined and then dressed to look like a casting. Look forward to the detailed description. This will be an interesting build and I'm looking forward to seeing how you tackle rejected castings which we talked about recently. I've had my fill of reject wheel castings lately! Well.... This might not be the " correct " way to use the Broach, but as they are made with a 1:100 taper I stop pushing the Broach on the last pass before pulling it out. This leaves me with the required taper in the flywheel boss. 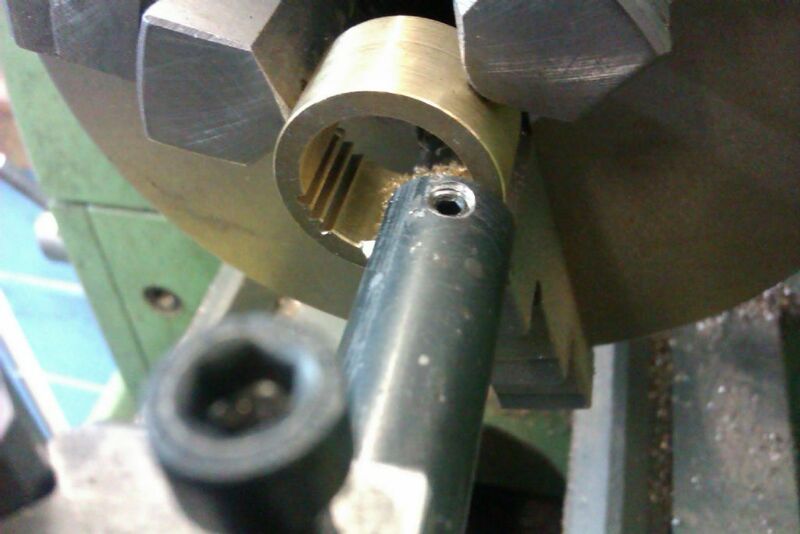 The correct way, of course is the taper in the bushing approach. I like the indexed idea shown in the photo but you will have to secure an eccentric outer shell to drive the outer strap back and forth. The castings I rejected were mostly of a cosmetic nature, pitting, slipped, over fettled etc. Nothing that couldn't be sorted with a little ingenuity. But shouldn't be sent off to a customer expecting them to deal with !! Pictures of the start of the gearbox in the next post. Getting ready to bring the chucking stub to size. Facing off with a C 15 radius Carbide tipped tool. Casting reversed and chucking stub made to exactly the same diameter as the other one.... There's a good reason! Squaring the parting off tool. Phew, thank goodness that's over with. All faced and ready for the next operation.